Recently, I read an article from 1843 magazine entitled "The Man Trap." The premise of the article examines how it is more difficult for men to move into female-dominated domain, in particular if they want to enter into a single income arrangement with their wives and with them being the house person taking care of the household. The Good News According to John? The fourth gospel in our New Testament is indeed an interesting piece of document for Christ followers to study. The past one week plus has been a journey reflecting on the gospel and asking ourselves some questions regarding familiar aspects of the gospel that we have never thought of before. There are at least three reflection points that I would like to share here. 1. Jesus as Logos: What is God's revelation really? In the fourth gospel, the Word (greek: Logos) is being introduced as being with God and having the divine quality of God (1:1). 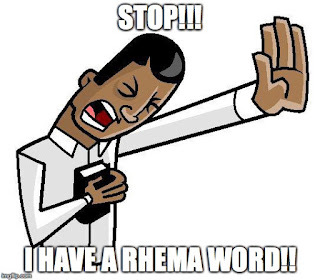 In fact, when I first learned of Jesus' identification as Logos years ago, a question came to my mind - why then are "rhema" words so special? My own study into logos and rhema was documented in here. The outcome of my study inspired a rage back then, knowing that many people have artificially created a divide in the word of God.